Another CrossFit OPEN has come and gone and a wealth of knowledge, experience and memories were made at AIO. I can’t begin to express how amazing it was to sweat alongside you, while witnessing you build your confidence and accomplish goals that many of you doubted were doable. The OPEN becomes the stimulus for pushing us farther than we expect, and for this reason, I’ve always loved being part of it. This year’s OPEN was so different than any other year. Five gruelling tests that challenged our conditioning, skill set and mental toughness. Week one was a long metcon of toe-to-bars, dumbbell hang power cleans and rowing. So many members redid this workout 2 to 3 times– strategizing, grinding and pushing their aerobic capacity. A highlight was watching Lynn, Nicole and Shirley all hitting their first toe-to-bars. They proudly have a new movement to add to their CrossFit rolodex. 18.2 and 18.2a was a two partner that pushed the pace, while setting our legs and lungs on fire!! If you were able to complete the couplet of front squats and bar-facing burpees, (an amazing feat in itself) you were given the opportunity to hit a heavy single clean. The workout alone was enough to make you sore for days and watching our members PR cleans after an intense workout had me in disbelief and bursting with pride. A shout out to Sarah P, Frank, Avina, Jeremy, Juan, Vanessa, Susan, Eric and Roger for this memorable achievement. Week 3 will go down as one of the most challenging workouts in CrossFit OPEN history. Once in a while CrossFit HQ introduces a new combination of movements, standards and intensity that we have never seen before. Many scaled the workout and achieved their first pull-ups while others got their first muscle-ups! Coach Tom and Coach Chris both showcased some strong muscle-up performances and kept inspiring AIO to push through our weaknesses, to make them strengths. A special shout out to Nicole, Christine and Shirley for getting their first pull up! 18.4 is otherwise known as “Why cant I do a HSPU? ?” The new forearm measurements was a huge challenge for most of us, myself included. Yet again the standard for human movement was raised and we all met the call. I remember watching Julia cycle HSPU, a very challenging movement, that she made look easy and flawless. A sincere shout out to her for putting the work in! As well, congratulations goes to Mike D, Christine and Dave W for getting their first handstand push ups during this workout. The fifth and final workout was 18.5. The CrossFit community got to vote online as to which chest-to-bar pull-up combo they wanted to do. It was a repeat workout for 7 minutes which saw a 3-rep ladder of chest-to-bars and thrusters. Thank you to our tenacious community for allowing me to witness so many chest-to-bar and pull-ups PRs! Daniela and Lyne got their first unassisted pull-ups and then graciously added several more to their score. Nicole also performed her first chest to bar pull up. They have vowed to never use a band again for pull-ups😉. Let’s hold them to that! The bar has now been raised by you, our beloved members. 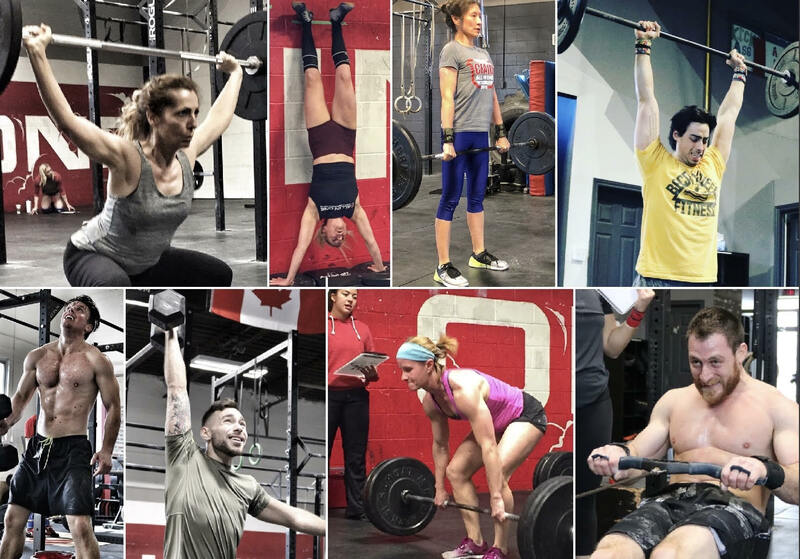 Whether you got your first pull-up, toe-to-bar, hit a max clean or participated in your first CrossFit OPEN, you are for sure not the same person you were 5 weeks ago. And that my friends, is what it is all about. Getting to know yourself as a person and athlete, pushing yourself outside your comfort zone, scaling to new heights and growing in our supportive community makes us all proud. So take this feeling with you in life, and especially to your next class. Remember you can always do a little more, go a little heavier, try what seems undoable, as there is always another way to climb the mountain we call life. P.S. So many stories, memories and beautiful moments that it is hard to contain in one blog post, and I’d love the space to mention each of you individually, but rest assured that I am immensely proud of all of you.